In the previous installment in this series (To Declare or Not to Declare, that Is the Question – Part III), I established the fact that, based upon James Madison’s arguments in an essay dated August 24, 1793 under the pseudonym “Helvidius”, the constitutional authority to “declare war” was reserved to the legislature as this action was tantamount to the passage of a law. Consequently, the president is not authorized to “declare war” on his own any more than he has the authority to enact any other piece of legislation. His role, Madison argued, is strictly that of execution, and unless he is given something to execute (i.e., law), he has no authority. This being the case, how then does Congress “declare war”? 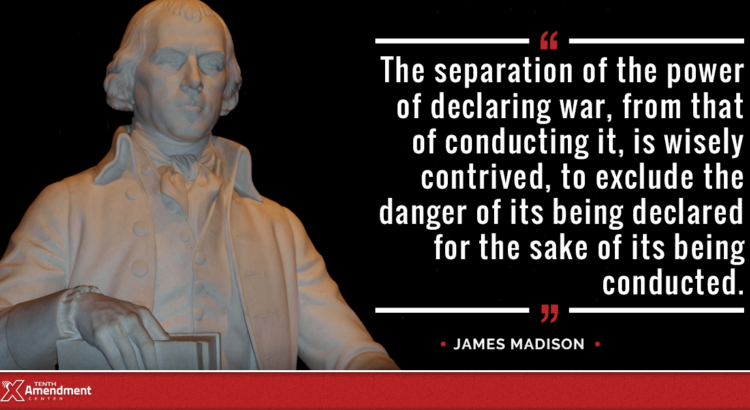 The Constitution is silent on the procedure, but if we proceed from Madison’s supposition that declaring war is a legislative act, then we can safely assume it would follow the course of any other passage of legislation. As I closed last week’s essay, I pointed out that to declare war requires the action of both houses of Congress, just like the passage of any other law. However, unlike the requirement that all bills relating to raising revenue (i.e., taxes) must originate with the House of Representatives (Article I, Section 7, Clause 1), no mention is given concerning in which chamber such a declaration must originate. This being so, we can assume that it can originate in either chamber. An argument could be made, again extrapolating from Madison’s argument, that since the conclusion of a war via treaty requires action on the part of the Senate, meaning that war cannot be ended without Senate approval, we could say that a bill to commence war would then originate in the Senate, but I believe that might be stretching a little too far. After all, the independence of the States might be at risk in the going to war, but it will be the citizens who will bleed and die, so an equally strong argument could be made that it should originate in the House. However, the safest conclusion is that a bill to declare war can originate in either chamber of Congress. Once a bill to declare war is passed according to the rules set forth in each chamber, to be official it would then, like any other act of legislation, require the signature of the President. Once signed, then – and only then – would he, as the Commander-in-Chief, have the authority to lead the military forces of the country into war. But, what if the President said that in his opinion, Congress was full of a bunch of hot-headed war hawks, and that to go to war would be foolish and dangerous and he refused to sign the bill or follow its directives? Could he do this? Would that become an act of treason and be an impeachable offense? The answers are yes he could, and no it would not be an impeachable offense. If the act of declaring war is just like any other piece of legislation, then he can veto it like any other bill, which would then require a 2/3 vote of both the House and the Senate to become law. Once his veto was overridden, then yes, he would be obligated to follow through or be in violation of his oath of office. Herein we see the wisdom of our founders in their ingenious insertion of checks-and-balances in our system of government. One individual, the President, cannot put the country at risk by declaring war on his own, but neither can a foolish bunch of Senators and Representatives unless the one who will be in command of the battles agrees. More on this next week. To answer this question we need to return to the Constitutional Convention of 1787 and understand the mindset of those who were framing our Constitution. If you read Jefferson’s Declaration of Independence you will see where several of the charges levied against King George III was his absolute control of Britain’s military and his abuse of that power. One of those charges was the fact the army was not under civil control. Repeatedly throughout the debates in the convention n 1787 the delegates expressed deep concern over the danger of having a standing army. They wisely did not want to vest in the hands of one individual the power to commit the country to war. Instead they chose to vest it in the legislature. Madison’s argument, summed up, is the President, as the chief executive, is charged only with executing that which has been authorized by the legislature. Consequently, the President cannot, on his own, execute a condition of war – only when authorized to do so by the legislature. He supports that argument by stating that since a treaty which would conclude a war cannot take effect unless ratified by the Senate (Article II, Section 2), then neither can the commencement of the war without consent of the legislature. This raises one final question, namely, does “declaring” war, based upon the foregoing argument by Madison regarding the conclusion of a war by treaty, only require the consent of the Senate, or does it require the House’s consent as well? Article I, Section 8 states that “The Congress shall have the power to…declare war.” Since Article I, Section 1 defines Congress to “consist of a Senate and House of Representatives,” then yes, both houses must agree on a declaration of war. But, why both? The answer is simple: if a war is engaged, it will be the people who will suffer the cost and pain of the war (not to mention their liberty and property being put at risk), and the sovereign states whose existence could be put in jeopardy, should have the decision-making power as to whether to put themselves in peril. Since the House represents the people and the Senate originally was to represent the interest of the states, both must concur on such drastic action. The basic function and reason individuals form societies and create governments is in a single word: protection. As free individuals, we momentarily set aside our natural right of self-protection and assign that to our government (until and unless the government fails or is incapable for any reason in protecting us, at which time we are at liberty to take that right back into our own hands). On the other side of the coin, Japan and Germany went down the road to war for the examples I gave for totalitarian regimes. In his final version, these words were omitted, but if you read the version he delivered, he spent a great deal of it encouraging his fellow countrymen and those who were to follow to limit their political engagement and alliances with foreign nations unless necessary for defense. Committing its citizens to a state of war is the gravest move that a government can make, for it places the lives, property and indeed its very existence on the line. This gravity is even greater when that nation is a free people for then liberty itself is at stake. Consequently, I believe that the wisdom spoken to us by Washington, even in draft form, behooves us to “declare” war only when such natural rights and our existence as a people is in danger. Alas, in most of our history, very few instances fall into the category as described by President Roosevelt. Since the adoption of our Constitution, there have only been five congressionally-declared wars, and only one of them was a declaration to go to war; the other four were like FDR’s request, merely an acknowledgement that a state of war was already in existence. However, as all of us know, our past is littered with military conflicts, both on this continent and abroad, so we must ask what was the purpose for including this power of war within our Constitution? We will continue delving into that question next week. Alas, today we are far from realizing Washington’s wish as there are tensions and saber-rattling occurring in all corners of the globe. I realize that it has been two weeks since I sent out my weekly essay, but because of the current situation in the world and the debate over who has the power to commit our country to war, i.e. the meaning of the constitutional power “to declare war”), I wanted to take time to go back and reread the writings/debates of our founders so as to share with you how they viewed this subject. There are many questions to be answered before addressing the meaning of this phrase as they understood it, and I plan on addressing them in a series of essays over the next few weeks, basic questions such as “Who?”, “Why?” “When?”, “How?” and “What?”. Answering these questions from the perspective of the founders and the history surrounding this issue will take more than one or even two 400-word essays, so I hope you’ll forgive my omission over the past two weeks and will look forward to this series.